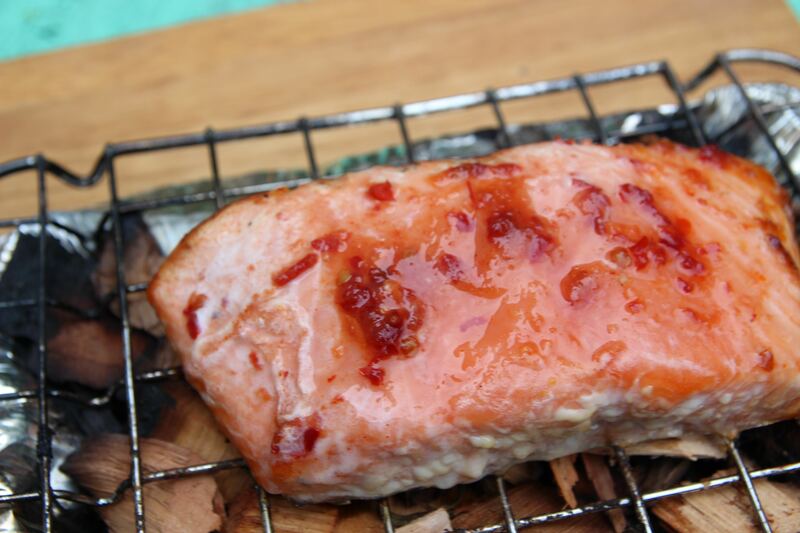 I started hot smoking salmon last year and now that’s about the only way I cook it. It’s incredibly easy to do. I followed Jamie’s instructions but then simplified his method to something that works really well. Basically, you get a foil take away food container, scatter some hickory chips inside, throw some woody herbs on top – rosemary works well. You need to acquire a wire rack to fit on top of the container. The fish fillet/s are seasoned by rubbing with 1/2 tsp salt and 1/2 tsp caster sugar and 1/2 tsp of sambal oelek (chili paste). It’s then a matter of laying the seaoned fish fillet/s on the rack and covering the container with aluminum foil. The foil is pierced with a skewer at intervals – this lets the smoke out. Cook on a very hot barbecue grill. Depending on the size of the fillet/fillets, and the heat of the grill, the fish takes between 10- 20 minutes to cook. I cook a medium sized salmon fillet for about 10 minutes for medium rare and about 12 minutes for cooked through. It’s important to let the fish “rest ” for a few minutes after cooking. For more information and photos of hot smoking, click here. 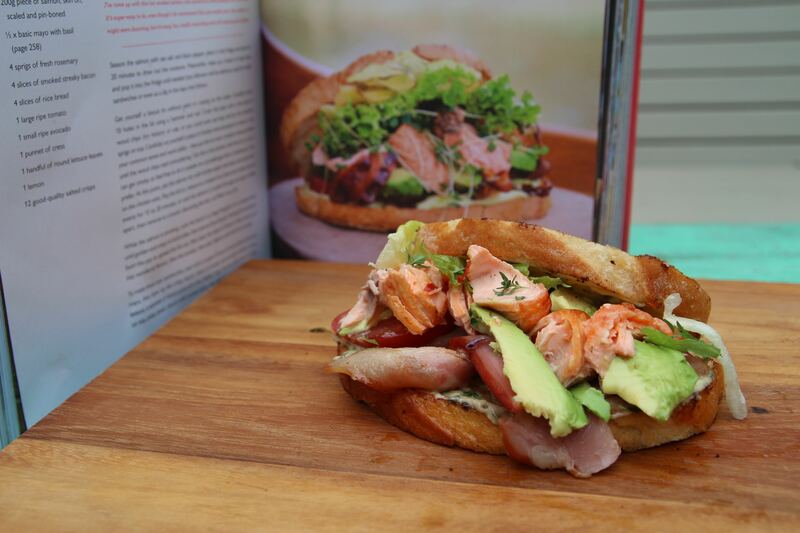 Jamie Oliver’s book Comfort Food has some wonderful recipes including this one for a Hot Smoked Salmon Club Sandwich, giving me another recipe for this method of cooking salmon. This is my version, with a couple of changes which I have noted. Hot smoke the salmon according to the above instructions. Remove to a board, discard the skin and flake into pieces (not too small). While the salmon is smoking, cook the bacon in a frying pan over a medium heat until crispy and cooked through, then remove from the pan. Swirl the pan to spread the fat out, then toast the slices of bread in the fat to soak up the wonderful flavour. Slice the tomato, peel, de-stone and slice the avocado. Spread the toast with basil mayo, then layer two slices with the bacon, tomato, avocado, salmon, cress if using, lettuce and a squeeze of lemon, and the crisps if using. Top with the remaining slices of toast. 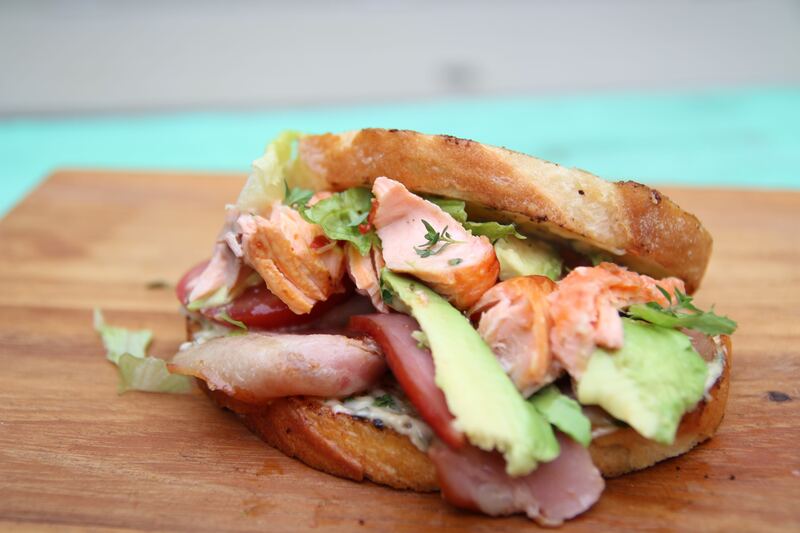 Posted in Bread, Fish, Jamie Oliver, Savoury Food and tagged avocado, basil mayo, comfort food, hickory chips, hot smoked salmon, tomato. Bookmark the permalink.